Home » News and Stories » Working with The Jane Addams Hull House Museum to engage youth in dialogues on the School-To-Prison Pipeline. 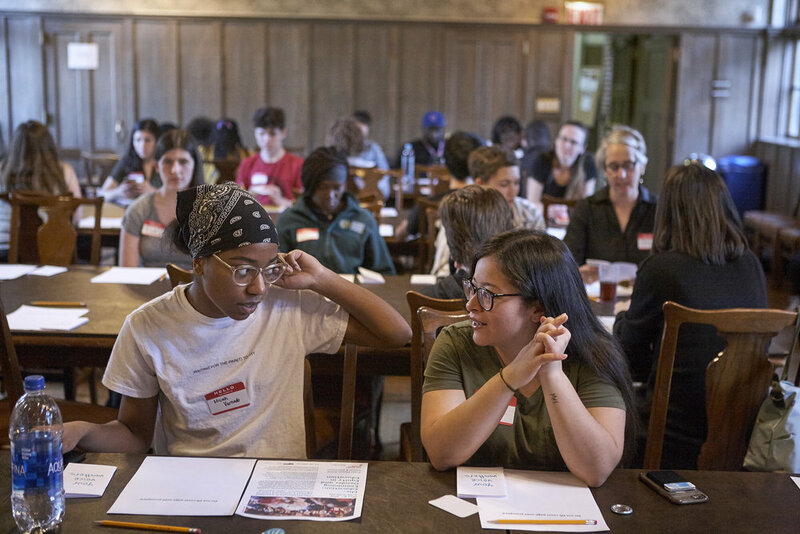 When the Jane Addams Hull House Museum wanted to join an International Coalition of Sites of Conscience project around the school-to-prison pipeline, they sought a community partner who had a history of youth work, activism and leading difficult conversations. For the museum this was not only an opportunity to engage with this project, but to find a community partner that could engage youth to lead community conversations around exhibits at the museum. Free Street trained youth on how to lead multi-generational dialogues around gender equity in education and the school-to-prison pipeline. In the designed dialogue series, FST youth and staff utilized theatrical techniques by creating experiences to kick off dialogues. These experiences gave audiences a look into the circumstances which shaped the lives of those affected by the school-to-prison pipeline. For example, at one dialogue, the event began with youth administering a standardized test. The environment mimicked school pressure to remind adults of the harsh conditions of student lives. The test featured questions about facts related to gender equity in education and girls in prisons, which gave participants time to reflect on statistics about the issue they were discussing before engaging with each other. These shared experiences proved successful as participants utilized the shared content to connect with one another and dive deeper into the conversation. With the success of these dialogues, Free Street was invited to present our model at the International Coalition of Sites of Conscience Summit in Memphis in 2017. Participating museums and organizations remarked on their surprise at how easy Free Street made it easy to engage with strangers around a difficult issue in an active and fun way. While this particular project has wrapped up, the success of the project has led our two organizations to make a deeper commitment to partnering our organizations in this line of work.